It was with heavy heart that I awoke today to learn that the legendary B.B. King passed away last night. I knew that he was in hospice care and the inevitable was near. However…that knowledge didn’t make reading of his passing any less heart-breaking. I had the honor and privilege of seeing B.B. King live in concert a few years ago. He was traveling with Peter Frampton’s Guitar Circus. The venue was relatively small…outdoors…the perfect setting for an amazing show. The atmosphere light…lively. Everyone was in good spirits, audience and performers alike. Seeing two icons on stage together…B.B. King and Peter Frampton…playing and laughing together like it was more a jam session than a concert. It was one of those moments you just stop and soak in for a minute or two because you know you will never see and experience anything like it again. There was no doubt that B.B. King was in the twilight of his career at that time. While he didn’t sing a lot, his voice was strong and lusty when he did. “Lucille” never sounded so true…so sultry…as made her sound that night. 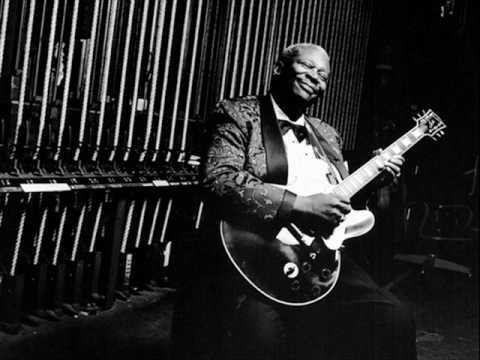 B.B King may have been in the twilight of his career. However, there was no doubt as to who was on that stage that night preaching the gospel that is the Blues. The most memorable moment occurred when B.B. King broke out into one of one of the most simple, yet popular songs ever created. A soulful rendition of “You Are My Sunshine” wafted across the air. The audience started singing with him and somewhere into the second chorus he stopped singing as we kept going. I was close enough to the stage that I could clearly see his him as he listened…a big smile on his face. With each chorus, we became surer of ourselves and you could feel this unexplainable synergy sweep across the crowd. He sat there, smiling, taking us in as he encouraged us to keep singing. At one point he said we sounded beautiful. As I sit here now and think about that moment I can’t help but realize how surreal that was…the King of the Blues…telling US…that we sounded beautiful! That’s how I will always remember Mr. B.B. King. You may be gone, but the thrill lives on…thank you Mr. B.B. King!